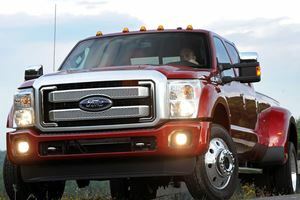 The Ford F-450 Super Duty truck has a 440 hp, 925 lb-ft 6.7-liter V8 turbo diesel engine, four-wheel drive and a 6-speed automatic transmission. 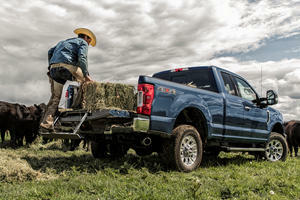 It is solely available with the four-door Crew Cab body, dual rear wheels and the largest 8-inch load bay. 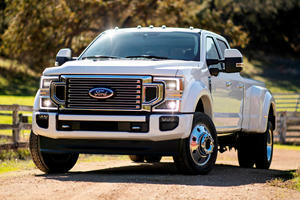 Ride quality can be hard without a load but the towing ability is superb and higher trim levels offer adaptive cruise control, massaging heated leather seats and a touchscreen navigation system. Not forgetting its commercial roots, work related options include a snow-plow package, 5th-wheel prep pack and heavy duty front suspension. 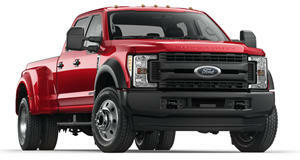 Ford F-Series Coming To The History Channel For "Truck Weekend In America"
Only in America are trucks loved this much.